Keo Ruug shrine in Zelda Breath of the Wild is located in Korok Forest. It is one of the most interesting challenges in the area. It has two rooms with two large gates. In order to unlock them both, you need to solve an interesting constellation puzzle. 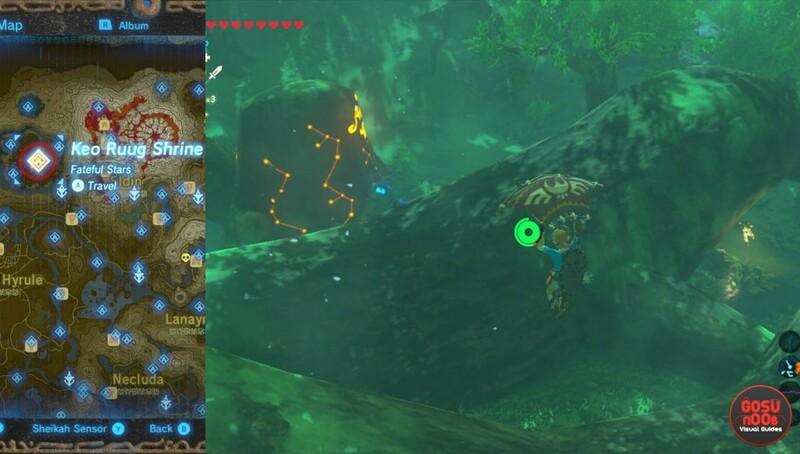 The first gate opens the path to the Spirit Orb, but the second allows you to reach the only treasure chest in the Shrine. In this guide, we’re going to help you complete Zelda BoTW Keo Ruug shrine, and show you how to complete the constellation puzzle. If you have trouble finding these mini-dungeons, be sure to take a look at our Zelda BotW Shrine locations map guide. Keo Ruug Shrine is located in the center of the Korok Forest. Although you don’t need to climb on some huge mountain, break some obstacles, or solve quests for it to show up. You need to deal with the Forest Fog. To deal with the fog, you need to approach the forest from the south. Be sure to bring one torch. In the southern part of the Forest, there are some braziers. Light them up and follow the trail of the torch’s fire. The wind will blow it into the safe direction, the one you should follow. If it’s extinguished for any reason, here’s what to do. Take a few steps into any direction. If you see the fog closing in, run back to the previous position quickly. Now pick some other path and take couple of steps in that direction, until you find the one without fog that closes in. You’ll know when you are on the right path as soon as you spot the giant stone mountain. There is a hidden pathway between two mountain sides that takes you to the Keo Ruug Shrine. The solution is rather simple, if you don’t react like me and go outside to wait for dark and look for the stars. The constellations you need to look at are in front of the Shrine’s central platform. Although they are in the second room, you can see them from a distance. Next to the circles where you have to put the balls on the wall, there are same signs. You can tell them apart and count them with the help of the constellation map in the second room. From the first room wall signs, in the opposite direction from them, the balls spots are marked from one to five. You can also tell from the number of lamp posts that are next to them. Place the balls in the correct order shown on the picture. The correct ball placement for the Chest gate. The chest behind this gate contains one weapon: Knight’s Claymore (38 damage). If you are wondering what else you can find in these shrines, we’ve covered the entire 120 shrines reward list. You are absolutely right, sorry for the confusion. I’ve fixed it, thank you.